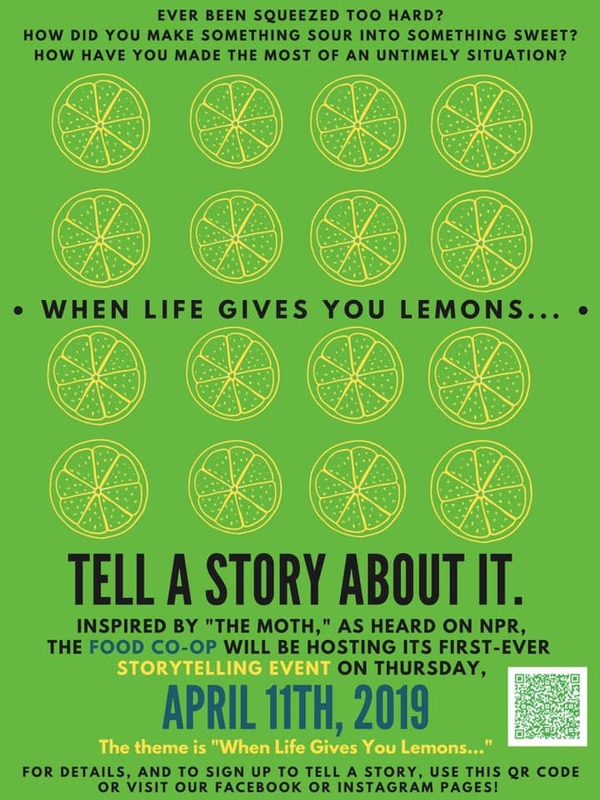 Stories will center around the theme "When life gives you lemons ... "
Facebook The Food Co-op will host its first storytelling event at 7 p.m. on Thursday, April 11. The life of a college student is usually one of ups and downs, trials and tribulations and successes and failures. Whether it be failing that organic chemistry test or realizing that your meal plan has reached single digits, the struggle is real for undergraduates. The Binghamton University Food Co-op is providing a space for students to share their experiences overcoming such obstacles with a storytelling event based on podcast “The Moth Radio Hour,” produced by live storytelling organization The Moth. Brought to listeners by a nonprofit group based out of New York City, “The Moth Radio Hour” is a show dedicated to the art of storytelling. The theme of the Co-op’s event is “When life gives you lemons … ,” which means that stories told will relay a time in the storyteller’s life when they turned a negative situation into something positive. Molly Heit, a junior double-majoring in biochemistry and integrative neuroscience who serves as the operations coordinator and a cook for the Food Co-op, said the Co-op has long stood as a comfortable and open community on BU’s campus and events like this continue to promote these values. Aside from supporting environmental justice, Heit said the Food Co-op also hopes to bring more people through the doors by diversifying their events beyond just food. The event will provide an opportunity for people to attend an event regardless of their stances on food and food restrictions. In addition to the contents of the event itself, Heit said the staff at the Food Co-op hopes that this night will open some people’s eyes to the work done by The Moth. The event will be held at 7 p.m. on Thursday, April 11 in the Food Co-op and storytelling will begin around 7:15 p.m. to 7:30 p.m. Food will be served. For anyone interested in submitting a story to be told, email foodcoop@binghamtonsa.org.